Sports betting is one of the most exciting and fastest growing ways to enjoy sports and other major events. Historically, sports betting has been in existence for hundreds of years, if not longer in some ancient societies. Today, the hobby has recently seen a dramatic increase in popularity thanks mainly in part to the internet. Players are now able to research their picks much more effectively and are also able to place bets without ever leaving their house. This convenience and increased control should continue to help sports betting grow throughout the next few years. Before we can address all of the benefits of sports betting, we need to make sure that you understand what sports betting actually is. If you're absolutely brand new to the concept of sports betting, don't worry, you are not alone. Not everyone has friends or family who are active in the hobby. Sports betting is simply the act of placing a real money wager on the outcome of a particular sporting event or another major event. Most people have probably placed a sports bet with friends and family and didn't even realize it. Have you ever bet someone $5 or lunch on who would win the football game? If you did, you've made a sports bet. The most simple form of sports bets is picking the winners of competitions. You can place a money wager on who will win a competition, and if you're right, you win! Sports betting is offered for almost every sport in existence with the most popular being football, basketball, soccer, baseball, boxing, and hockey. Most sportsbooks also offer slightly less popular sports including combat sports (UFC), NASCAR, golf, and tennis. Some sportsbooks take this a step further and offer every sport under the sun including volleyball, handball, bowling, and croquet. Nope. Some sportsbooks go even further and offer wagering on non-sport events like politics, WWE, and competitive eating. You can literally sports bet on just about anything that has an unknown outcome. There are plenty of sports bets offered that are more complex than picking a basic winner. Sometimes you can pick how someone will win, how long it will take them to win, or how many points each team scores. It gets much more complex than this, but you probably now at least have a good idea of what sports betting is and the different options that are available. The sky is really the limit. If it's something you want to bet on, some sportsbook somewhere will probably be offering action on it. Now that you're up to speed on what sports betting is let's talk about the benefits and why you would want to sports bet. The main reason that most players get involved in sports betting is for entertainment value. Watching live sports is fun, but the rush and excitement can be really amped up when you have money on the line. We all have our favorite teams to watch, but unfortunately, they don't play every day of the week. Sometimes we have to wait several days or even weeks to watch our favorite team or players compete. While we wait, we can watch the other teams in the league compete, but it usually is just not as exciting if our team is not involved. This is where sports betting can help out. If you're in the mood to cheer and get excited for a game that you normally would be less interested in, a small sports bets wager can do the trick. You might not care about either team competing, but if you have a few bucks on one of the teams, they will instantly be your favorite team for the duration of the game. This can even work with sports where you don't even have a favorite team and might be less interested in the outcome of the game. It doesn't take a huge bet to get the excitement going. Even a small $5 or $10 bet can get you excited about a normally boring game to you. This also works on games that you are already hyped up for. A small wager (or a big one) on a game you already care about can take the excitement level through the roof. Just be careful when wagering on your favorite team that you don't let your emotions get in the way of a smart bet. We typically recommend not betting against your team even if it's a good bet because you will be conflicted cheering the whole game. If you're looking for entertainment, this can get confusing. Some people might say you're crazy or not smart for wagering on sporting events. These people will say this whether you are betting $5 or $5,000. Unfortunately, they aren't giving sports betting the fair shake that it deserves. If we go bowling, we will have to pay for shoes and a lane rental. We pulled up our local bowling alley and found that the price of shoe rentals was $3 and games were about $4 a piece. If we bowled two games, we'd be playing for about an hour and spend around $12 after taxes. If you placed a $10 wager on a football game, you would be entertained and having fun for three hours. For only $10, you got three hours of entertainment and excitement. This is cheaper than bowling and lasts three times as long. We can't forget the most important part, though. You have the potential to WIN money. With bowling, the only outcome is that you lose $12 and get one hour of fun. With the sports bet, you can either lose $10 and get three hours of fun or win $10 AND still get the three hours of fun. If you look at sports betting as paying for entertainment (just like you would with bowling or any other activity), it's cheaper, and you get more bang for your buck especially on the days that you win your bets. The above example also assumes that the only entertainment you are getting from the sports bet is during the game. Lots of players love to sift through stats and talk with their friends about upcoming games to decide who they think is going to win. All of this research could be done with no sports bet, but it becomes so much more fun when you have the potential to get paid for making a correct pick. This can be a few additional minutes of fun or hours of fun, depending on how serious you like to take it. A lot of sports bettors say that the research and actual pick making is more fun to them than watching the actual game. When you actually break it down, sports betting can be a really cheap hobby that delivers a lot of entertainment value. The best part about sports betting is that you always have the potential to make some money! Regardless of the size of your bet, you always have the ability to win which not only feels great but puts a little extra padding into your wallet. This money making doesn't have to stop with just making a few extra bucks here and there. A lot of people have trained themselves to become professional sports bettors. They've learned how to sift through stats and really just have a keen eye for making correct picks. If you're someone who is great at predicting how games are going to go, sports betting may be for you. The actual correct answer is yes and no, depending on how you approach it. For players who just like to make some quick picks and enjoy the games, sports betting is probably a lot closer to random gambling for them. Gambling, by definition, is a game of chance where you have no statistical edge. If you are just randomly picking teams and winners without much thought or research, you're using sports betting as a form of gambling. Now, if sports betting were straight gambling, professionals would not be able to make a consistent living doing it. If you are using stats and strategy to make your picks, you can gain a statistical edge depending on how good you are. For these players, sports betting is far from gambling. Usually, for these players, it becomes a big money way of life. We would like to disclaimer here that being a professional sports bettor is a challenging profession. For that reason, we don't recommend you run out and quit your job tomorrow and start betting every game. Start slow and see how you do with smaller bets. Only wager what you are willing to lose. If things go really well, then you can consider taking the hobby more seriously. For most players, sports betting will always be just a form of entertainment. But for the lucky few who have a real knack for picking games, it can become so much more. Sports are always more entertaining to watch when we know what is going on. However, to know what is going on you have to watch the sport a few times. This means to learn about a new sport you are forced to suffer through some confusing and boring times where you aren't really sure what exactly is going on. Small sports bets can really help turn these boring learning periods into exciting learning periods. Putting a small wager on a game can help you to be interested enough to stick around and learn what is going on. Don't know who to pick? Pick someone at random or read some free gambling tips online to see who the pros like. We don't recommend ever making this a big bet as you are just taking a shot in the dark. A few bucks can go a long way though to help you get over the hump of learning the sport. Once you learn the sport, you can continue to bet if you'd like to or just enjoy the sport that you now understand. A lot of our favorite hobbies are great, but we just can't play them every day. This can be because they are too expensive or maybe they are a physical hobby that our bodies aren't strong enough to endure every day. Sports betting, on the other hand, is an affordable hobby (or profession) that you can play and enjoy every single day. Because of the variety of sports offered, there is always something going that you can bet on. You're also able to enjoy sports betting from the comfort of your own home. Regardless of if you bet online or in a casino, you can enjoy the excitement and rush of the games from your own home or even from a friend's house or sports bar. You're never required to be anywhere, in particular, to enjoy sports betting. Bowling, as we mentioned earlier, is a lot of fun, but you are required to drive to the bowling alley, and they are only open certain hours. You also might not be able to get a lane because they have one of those silly leagues going on as well. You can never be shut out of sports betting, and you never have to "wait for a lane" to open up. For those of you that choose to bet with an online sportsbook, the convenience gets even better. You literally do not have to put on pants or step foot outside of your house if you don't feel like it to enjoy sports betting. It's the ultimate in convenience and easy to access fun. Some hobbies and activities require you to purchase lots of equipment, learn a bunch of rules, and then put in tons of time to even be able to participate. This can be rewarding for a lot of hobbies, but it also takes a big time and money commitment that you might not have the time or resources to commit to. Sports betting, on the other hand, is extremely easy to get started with. It requires no additional equipment and doesn't require a big financial commitment to get started. You can literally start by betting $5 on one game (or less at some sportsbooks), and you're off to the races. We should also point out that you are never required to bet more than this just because you've been doing it for a while. Some regular players bet $5 a game and have been doing so for years for fun. With the growth of online sportsbooks, you also have the ability to get started right now. You no longer have to drive to a casino or track down your cousin Vinny who you hear is a bookie somewhere. You can now safely and conveniently place your wagers from the comfort of your own home in a matter of minutes. Think we're kidding? We're not. It is seriously one of the easiest hobbies and pastimes to get involved with. Why does Sports Betting sometimes get a bad name? It wouldn't be fair to you the reader to only address the positives about sports betting and not address the negatives that some people think exist. If you've ever talked to a lot of people about sports betting, you've probably come across someone who spoke negatively about it. Some people have described it as a "nasty habit" that only degenerates get involved with. Unfortunately for these people., they clearly do not have a firm grasp on what sports betting is and how much fun you can get for such a small amount. In our experience, these negative Nancys have either personally or know someone that has had a problem with sports betting. There is a very small percentage of people that get into sports betting that bet outside of their means. This means that they start betting way more money than they can comfortably lose. Unfortunately, these bettors lack of self-control with their bankroll also bleeds over in their self-control with making smart picks. They are usually action junkies who are only looking for the rush. Thankfully, this is a very small minority of players, but because of them, a few people like to speak negatively about sports betting. As long as you are wagering for fun and only wagering amounts of money that you are comfortable losing, sports betting can be a great hobby and past time. You get so much entertainment value from sports betting for a fraction of the price of other hobbies and activities. People typically have a tendency to speak negatively about things that they don't understand. Don't let them sway you from trying something fun that interests you. If you try sports betting and it's not for you, you never have to bet again. That's the beauty of the game. You are free to bet as often or little and as much or as little as you would like. You are in control of your fun. 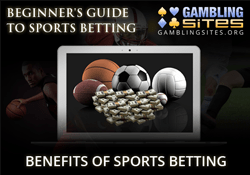 As you can probably tell, sports betting is an activity that comes with a lot of benefits. Most people aren't aware of the amount of fun you can have for such a cheap price. Not only can you have fun, but you also always have the potential to make money! This goes for recreational and serious bettors. You're able to get the same return on investment as a recreational bettor that the pros are getting. If you're convinced you're ready to try sports betting, check out our next article on the basics of sports betting.